The much anticipated semi-final clash between host Den Amstel and upstarts Uitvlugt Warriors in the Vitamalt/Aqua Mist sponsored West Demerara Football Association (WDFA) Knockout Competition came to a disappointing conclusion on Saturday evening, at the Den Amstel Community Centre ground. 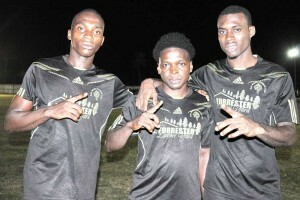 Den Amstel marksmen (from left) – Delon Lanferman, Travis Hilliman and Andre Hector pose for a photo op following the controversial end to their clash against Uitvlugt Warriors on Saturday. Playing in the feature game of a double header, Uitvlugt Warriors after trailing 1-3 at the break decided not to contest the second half, citing poor visibility following the malfunction of one of the lighting systems on the right side of the field, thereby handing Den Amstel an easy passage to the final where they will face Slingerz FC, 1-0 winners over a game Pouderoyen unit that exhibited admirable defensive discipline. The Warriors management even after being cautioned by the standing officials that in their opinion the lights were sufficient to continue play refused to do so after in-house consultation and subsequently relayed their decision to the officials, before exiting the playing area. The highlight of the night’s premature end was very unfortunate since the large crowd that had assembled at the venue braced themselves for a riveting final period after the homesters went to the break with a handy two-goal cushion which was engineered through some lovely interplay between the forwards and centre halves. Den Amstel touted as the likely contender to dethrone Slingerz from the West Side Kingdom, started off in full offensive mode and netted as early as the first minute of play when Travis Hilliman produced a piece of magic, dinking the ball over the advancing goalkeeper’s head, before witnessing it land down the centre of the goal. It evoked rapturous celebrations from the partisan band of supporters who saw their team take an early lead in the clash for a final berth and a chance to significantly improve its coffer. However, the early setback did not seem to faze the Warriors and they responded ten minutes later through Keon Duke, who cleverly broke the intended offside trap following a pinpoint pass, rounded the keeper expertly, before firing into an empty goal to momentarily hush the opposition’s devotees and bring the scores on par. Den Amstel, however, would not relent in their pursuit to regain the lead and did so in the 35th minute of play when Andre Hector finished clinically after latching on to a squared ball from Delon Lanferman playing on the right flank. Lanferman, one of the team’s most prolific scorers, finally etched his name on the scoresheet when he placed a low shot into the lower left hand corner of the goal. Earlier, Slingerz FC fans had to endure some anxious moments, before Captain Tichard Joseph eased their agony when he unleashed a pile-driver from just outside the penalty area that blew past the Pouderoyen defensive line and custodian and settle into the back of the goal in the 71st minute. It was worth the wait, but their fans will be hoping to see a much improved performance when they battle Den Amstel in the final on December 26, at the same venue. 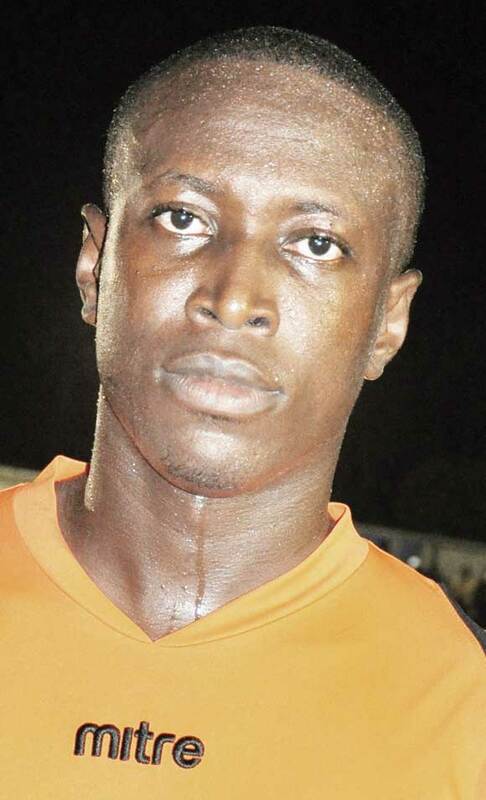 Former national striker Anthony Abrams gave early indications about their intentions when he fired just outside the upright and then had to endure more torture when his screaming right-footer slammed onto the crossbar and rebounded into play, causing much relief to the Pouderoyen side. Pouderoyen all this time soaked up the pressure, showing good defensive discipline, while reminding Slingerz FC of their counter-attacking ability as well. On one such counter-attack, they nearly grabbed the lead when Sherwin Bernard’s shot from the edge of the box prompted a diving effort from the Slingerz FC goalkeeper to parry it into touch. Shortly after, however, their defensive establishment unexpectedly crumbled allowing the dangerous Joseph sufficient freedom to lash past the keeper in a flash. It all started when Devon Millington evaded his marker on the right side and made a cross into the box which received a poor clearance that landed into the path of Joseph and the result is a place in the final. Pouderoyen will now play Uitvlugt for third place. Up for grabs is $1million for the winner, runner-up takes home $500,000, 3rd place-$300,000 and 4th place-$200,000.